Soil salinity affects plant growth and survival because ions (mainly Na+ and Cl-, but also Ca2+, Mg2+ and SO42-; Richards, 1954) increase in the soil solution to concentrations that adversely decrease the availability of water to the plant (the 'osmotic effect'). The accumulation of these ions in the plant tissues also impairs plant metabolism and growth (the 'toxic effect') (Greenway and Munns, 1980). The effects differ in their timing: the osmotic effects are immediate, but the ion toxicity effects take time (days or weeks) to decrease growth (Munns, 2002). 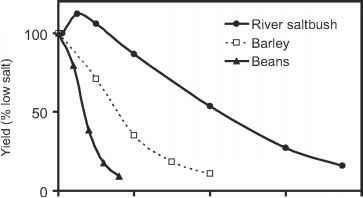 Figure 6.1 shows typical vegetative growth responses for three species: river saltbush (Atriplex amnicola; a typical halophyte), barley (a salt tolerant crop) and beans (a salt sensitive crop). Most crop species would have economic yields only at soil ECe values less than 10 dS/m. • High Na+ (and Clexclusion at the root surface: this refers to the root plasmalemma having low permeability, the uptake of Na+ being regulated by K+-selective transporters and channels, and the efflux of Na+ being regulated by Na+/ H+ antiporters (Colmer et al., 2005). • High K+/Na+ discrimination: this refers to the maintenance of K+ uptake even in the face of very high Na+/K+ in the soil solution; these traits are also regulated by K+-selective transporters and channels, and effective efflux of Na+. This trait is important because Na+ can compete with K+ for uptake by the roots, and K+ is a major osmoticum and macronutrient that is essential for enzyme functioning. • Ability to remove ions from the xylem stream: this refers to the localizing of ions into less damaging locations than leaves (e.g. Cl- in leaf sheaths of sorghum -Boursier et al., 1987; Na+ in stems of beans - Jacoby, 1964; Na+ in leaf sheaths of durum wheat - James et al., 2006). Fig. 6.1. 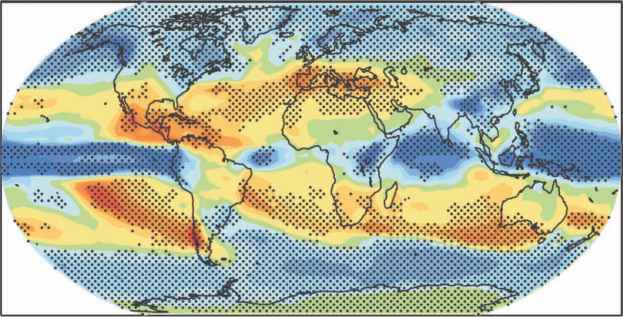 Growth responses of young plants to salinity (Barrett-Lennard et al., 2003). We have assumed a soil at field capacity salinized with NaCl (Richards, 1954). • Ability to tolerate ions in the tissues: this refers to the ability of plants to effectively compartmentalize Na+ and Cl- into cell vacuoles where they have a lower chance of interfering with the activities of the enzymes involved in metabolism in the cytosol and cellular organelles. • Ability to adjust osmotically: this refers to the accumulation of solutes in cells to maintain cell turgor, and is achieved through the compartmentation of ions (particularly Na+ and Cl-) into vacuoles, and the synthesis of organic solutes (e.g. glycinebetaine and proline) that are compatible with enzyme function, which are located in the cytosol. • Enhanced ability to accumulate Na+ and Clin older rather than younger leaves. • Enhanced vigour, and early flowering and grain filling: this refers to the ability of the plant to grow rapidly when conditions are cool and soil water is more available, and the ability of the plant to complete its life cycle before the salinity of the soil solution increases at the end of the growing season. In addition to these traits, it is also necessary for seeds to remain viable and germinate in saline soils, and although genotypic variation exists in the tolerance of seeds to salinity (Ungar, 1978; Nichols et al, 2009), the physiological traits associated with this capacity are not known. Some of the above traits are relatively easy to assess. For example, Na+ and Cl-exclusion and the discrimination between K+ and Na+ can be assessed by measuring the concentrations of ions in specific tissues such as the youngest fully expanded leaf (as recommended by Greenway and Munns, 1980). However, other traits can be harder to assess. These include the ability to adjust osmotically (which requires accurate measurements of the change in relative growth rate in the immediate few days after salinity is applied) and the ability of plants to tolerate ions in the leaves (which requires measurements of the degree of leaf senescence specifically caused by salinity). The use of non-destructive imaging systems to assess plant growth over short time frames, and to separate natural- from salt-induced senescence in leaves may lead to greater progress in the latter two areas (cf. Rajendran et al., 2009). Given the wide range of physiological traits associated with tolerance to salinity, it is not surprising that reviewers have suggested that this tolerance requires the involvement of a number (unknown) of genes (Flowers and Yeo, 1995), and attempts to improve the salt tolerance of crop plants have only occasionally been effective (Colmer et al., 2005; discussed further in the 'Breeding for Tolerance' section).